Solar All-In-One PIR LED Streetlight. Solar Powered Street and Carpark LED Light. 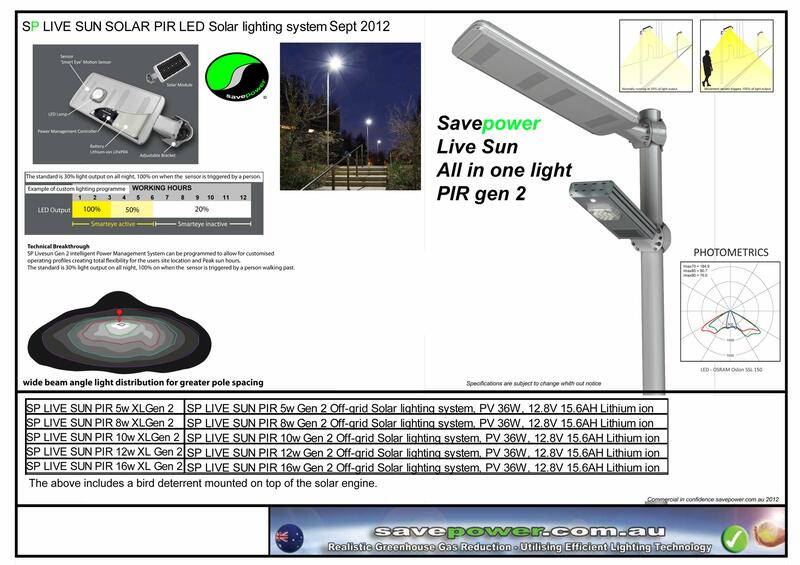 Savepower solar powered street, park and pathway lights are easy to install, are reliable and very cost effective, they are a great lighting solution at site locations where mains power electricity is not available or is to expensive to implement. Solar powered street lights can be used in most locations, where there is full Sunlight available, as no mains power source is required, they can be installed for lighting at parking lots, streets, parks and pathways, and in remote locations by simply fitting them to a pole. Solar powered street lighting is less expensive to purchase and install than traditional main powered HID street lights; as traditional street lighting requires significant infrastructure, engineering, and costly installation including the trenching of power cabling and power from the grid is required to run the lights, along with long-term on going power costs. Solar powered street lights do not require connection to mains power, they have an Extra low voltage stand alone DC power source which is safer and easier to install. Solar powered street lights are not effected by mains power cuts, the lights remain on as they have a stand alone power source, reducing the chance of accidents and the constant light deters theft/vandalism from nearby businesses, during power cuts at night. The operational power cost of a solar powered street light is ZERO , as all the power needed to run a solar powered street light at night is all generated by the solar array converting light from the Sun during the day into electricity, which is then efficiently stored in a battery, for use at night. Traditional mains powered HID street lights use power from mains power grid systems, which are fed by a power generation plant, that generates electricity and is usually coal or gas fired, which costs money and causes pollution and CO2 emissions. Our Savepower solar powered street lights have the power source (battery) located directly on the light ﬁxture reducing the risk of damage and theft. No need to trench power lines to the pole, run electrical wires up the pole and connect wires to an electrical grid, or hard wire the street light, the installation is much faster and more cost effective. Our Savepower solar powered street lights uses LED lighting technology, which does not contain Heavy metals, such as Lead or Mercury gas that traditional HID lights do. Our Savepower solar powered street lights are a complete stand alone system they have a very low Environmental impact, are durable, long lasting and recylable. So remember that old saying "Oils ain't Oils" well "Solar ain't Solar", when you choose your next supplier for stand alone solar lighting systems.